Let me begin with the end of an article I wrote for the NAFSA International Enrollment Management (IEM) e-newsletter. If you’re interested in reading the piece in its entirety, follow this link. 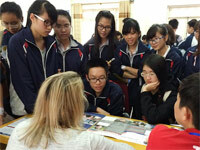 Vietnamese students gathering info about US higher education education. Vietnam is a country on the move. Daunting obstacles have been overcome and suffering redeemed. Phenomenal progress has been achieved with new summits yet to be conquered. Vietnam’s greatest resource is its people—hardworking, motivated, always in search of ways to improve their lives through education and training. How can your institution benefit from incorporating Vietnam into its internationalization strategy? What contributions can you make to help take Vietnam to the next level under the rubric of global service and in the spirit of doing well and doing good? Given the increasing number of Vietnamese returning home and the landmark contributions they are making in the public, nonprofit, and private sectors, to the benefit of themselves, their families, and their country, as well as the significant contributions of those who make the very personal decision to remain abroad, student recruitment is one such area.